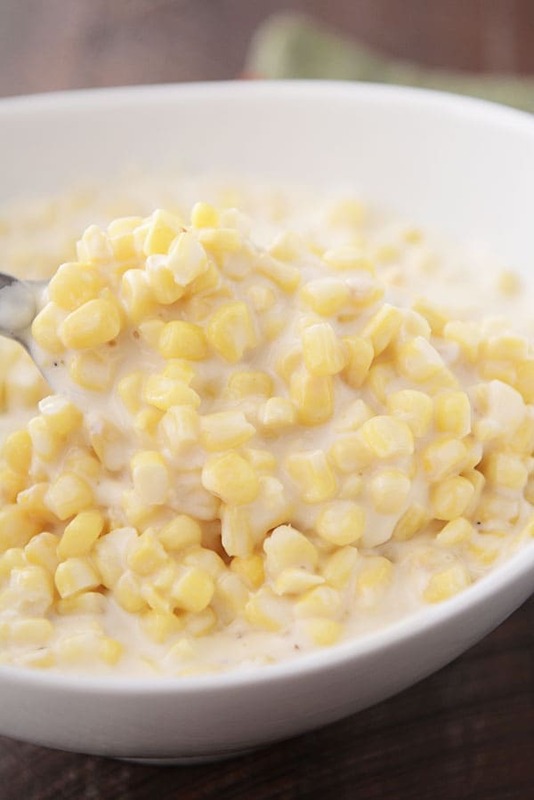 This simple but amazing Parmesan cream corn side dish is a Thanksgiving must-have. 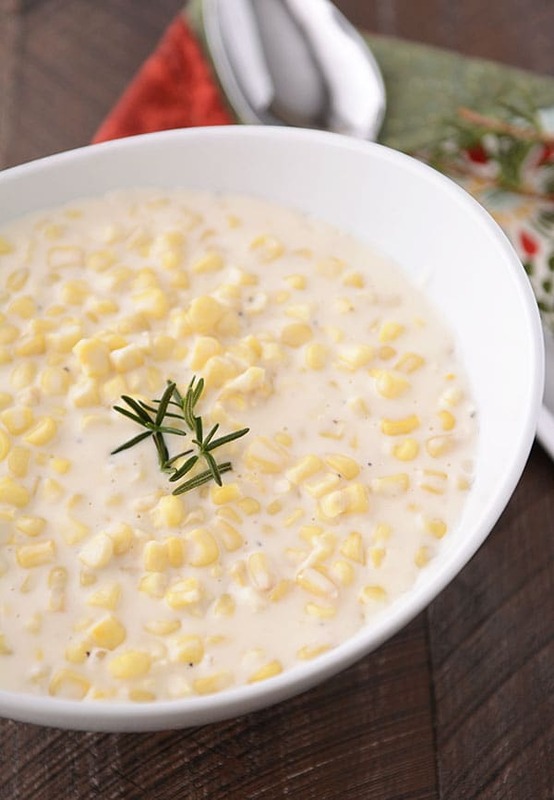 Sweet corn swimming in a creamy Parmesan sauce? Bring it on. I am loving all the comments on this post earlier in the week about what’s on your Thanksgiving menu. I could read stuff like that for days on end! It’s so fun to see what foods/recipes have become tradition for other people, and it’s interesting to find out how and why some of these dishes have to be part of your Thanksgiving. No really, like have to. I can tell that for many of you, eliminating them from the lineup could create a very hostile environment. If I’m being honest (don’t cringe! ), I’m often the one who wants to turn Thanksgiving on its head every year and do something completely untraditional, like maybe take the Thanksgiving classics and put a Mexican-style spin on them, or perhaps do an all-out homemade pasta or pizza lineup, or maybe get really crazy and grill salmon. But I can never really convince myself (or my family) to fully get on board with it, even on those years where we’ve celebrated alone since we don’t live by family (and our friends have deserted us). The truth is, turkey (while I love it; it’s one of my favorite parts of the traditional Thanksgiving meal) isn’t that exciting. And some of the old stand-by’s I could take or leave (sorry green bean casserole, I’m talking to you). But Thanksgiving is more than just the actual recipes. It’s the feelings behind them and the sense of tradition they bring. The anticipation of the Thanksgiving meal is almost as wonderful as the actual meal (and certainly more exciting than the cleanup), and that’s what I love. Reading through your comments has made me really think about what food traditions my kids will take with them after they leave my home. Sorry to get all sentimental on you, but I love these types of conversations. I am certain (dead certain) that this Parmesan cream corn is going to be one of those have-to-haves from here on out. Brad and Cass (bro- and sis-in-law) brought it to a large, extended family Thanksgiving last year, and I kid you not, it totally stole the show. No one even cared about dessert because this cream corn is so ridiculously amazing! It’s the type of thing you don’t think you really crave or need in your life until you eat it, and then you find yourself obsessed with the idea of making it every day for the rest of forever. And extremely simple to make. If you are looking for the perfect side dish this Thanksgiving, this Parmesan cream corn should skyrocket to the top of the list. I know I’ve waxed poetic before about this fabulous confetti corn dish…and today’s cream corn recipe is right up there in deliciousness. No need to relegate it to Thanksgiving-only fare, either. We’ve been making it to serve alongside grilled chicken, baked chicken nuggets, and roasted pork tenderloin. The yumminess of this cream corn is out of control. 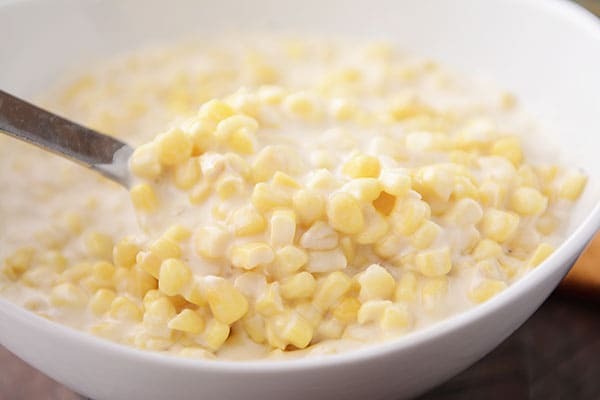 In a medium saucepan, combine the corn, cream, salt, sugar, pepper and butter. Heat over medium heat, stirring often, until the butter is melted. In a separate bowl or liquid measuring cup, whisk together the milk and flour until smooth (can also blend to avoid any lumps). 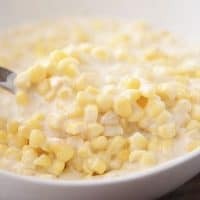 Add the milk mixture to the corn, stirring quickly, and cook over medium heat until the creamed corn is thick and bubbly. Remove from the heat and add the Parmesan cheese. Stir until melted. Season to taste with additional salt and pepper, if needed. Serve. The creamed corn will thicken as it cools. It can be kept warm on low in a slow cooker (or in the oven at 200 degrees) for up to an hour before serving. I usually use Costco's frozen white sweet corn for this but I think several varieties would fare well. I also use heavy cream, since it's what I have on hand, but I think light cream and even half-and-half might make a great substitution if you want to experiment. Next Post » Mel’s Mini Gift Guide: All About Games! This is my family’s favorite. I have made this many, many times. I will bring to Christmas again this year, as it’s my favorite too. SO easy and SO good. Thanks Mel. Amazing! Everyone loved it. It’s become a Sunday dinner staple and HAS to be on the Thanksgiving menu. Thanks Mel! Made this for a pot luck and it was easy, fast and delicious! Thanks Mel. Best corn recipe ever. Kids and adults LOVE it. My husband really likes canned creamed corn but I can’t stand it. It looks like someone already chewed it for me. So I made this tonight. He tried to talk me into putting all or some of it in the blender but I stood my ground. Fabulous and he likes it too!!!! This was pretty much the most amazing thing I’ve ever eaten!! I made this recipe for Thanksgiving, and it was a huge hit! I love that it’s made on the stovetop and not the oven. I made 1-1/2 times the recipe, about an hour before dinner, and kept it in a crockpot on the Warm setting. I left the lid of the crockpot ajar, so that the sauce thickened a bit. It was perfect! Thanks so much for this recipe. This was such a hit at our Thanksgiving feast! Thanks for the recipe! Hi! I’d like to make this for a work potluck, but some of my co-workers are gluten free. Is there a good way to make this without flour (or gluten-free flour)? Thanks! I haven’t tried a gluten-free version, Caitlin. Sorry! You could try subbing cornstarch and see how that works. Thanks for your help! Cornstarch was my best guess, too, so I’ll give that a try. I made this tonight. I do not like creamed corn. I LOVED THIS!!!! So not like the canned stuff. Thank you!! Hi Mel – would you reheat this in the oven or on the stovetop? I think either could work, but I’d probably use the stovetop so I could control the temp and not overcook it. Do you think that this recipe could be adapted for the crock pot? Looks so good! How well does it reheat? I’m thinking my grandma’s oven is going to be a crowded affair when I help on Thanksgiving so I need to do some planning! Loved it!! My husband went crazy for it too. Reminds me of creamed eggs on toast. But now the hard question- should I bring this or confetti corn to thanksgiving dinner!!? Really, I can’t go wrong! Tried this recipe for cream corn the day it was posted and we loved it! My recipe binder is now full of recipes from your website, and you have helped me create so many “new” family favourites. Thank you so much for all of the time you spend helping us create happy family memories around the kitchen table!!! Yay! So happy you loved it! Can i sub half & half for the cream? I do that for soups, and i never taste the difference. I want to go swimming in that corn!! Turkey day here we come! I have been making this corn recipe for more than 30 years . My original recipe is from Gullivers ( Newport Beach California ) and is called Gullivers Cream Corn . The recipe calls for broiling the cheese on top , but I never have . I usually make 4 X the recipe and put it in a slow cooker to keep warm .This corn goes really good with Ham and I don’t dare show up to Christmas dinner without it ! It is very yummy ! I also brought your delicious Brookies for dessert , yum ! Ohhhh, yummmm- this looks so good!!! I’ve been thinking about side dishes to bring to my mom’s house this year- it’s going to be garlic and thyme braised carrots. I think it will be a winner!! Thanks for the creamed corn recipe, Mel!! This sounds awesome!! My kids might be upset if we didn’t do the confetti corn, but this might be a great one for this Sunday dinner to see what they think. Thanks! I love cream corn and haven’t had it in ages! We’ll have to try this soon! This looks like it may replace my whiskey carrots…corn AND parmesan cheese?? Together??? Oh. My. Goodness. Sounds like a winner for my family. Thanks for sharing! Whiskey and carrots? Say what? Do tell!